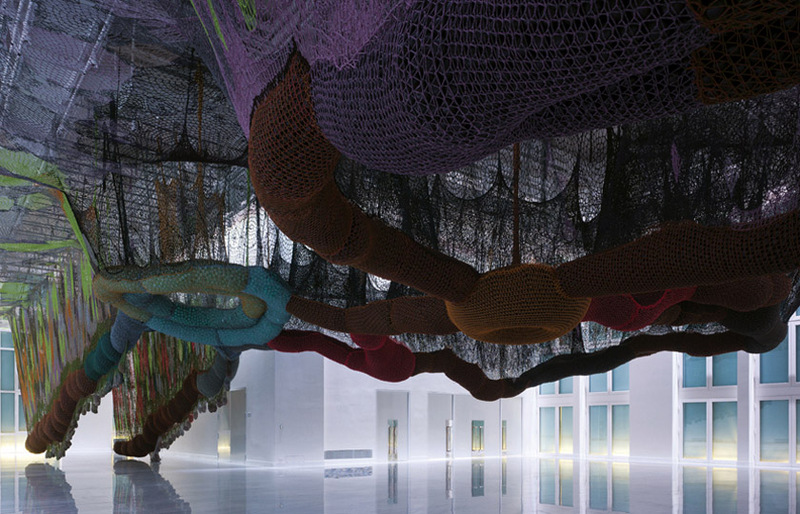 Brazilian artist Ernesto Neto creates installations placing the spectator at the center of the action, making the interaction a key part of his art. His abstract constructs often take up the whole exhibition space creating spatial labyrinths from yarn, rope, fabric and polythene foam as well as spices, such as saffron and cloves, tucked into pouches that hang down at various points. The spectator typically is invited to touch, smell and enter the space. Neto’s current exhibit at the Faena Arts Center in Buenos Aires fits the profile perfectly. The hundred-year-old Faena Arts Center was one of the country’s first big mills producing close to a thousand tons of wheat a day. Having retained the structure’s original ceiling height, as well as its generously proportioned windows and arches, it certainly provides a spectacular setting for Neto’s latest impressive and imposing sculptural installation. Ernesto Neto’s exhibit will be up through November 2011. This entry was posted in Art, Event, Fun, Just Plain Cool. Bookmark the permalink.